Prior to the automation of Covesea Lighthouse in 1984, a Principal Lightkeeper and an Assistant, with their families, lived at the lighthouse. The families were almost self-sufficient, and would have kept sheep and cows at the station. These would have been housed in the Old Steading adjacent to the lighthouse. Lightkeeping was a remote, lonely and hardy existence. You can imagine being a lighthouse keeper by staying in the Covesea or Halliman Cottages, which are available for rent as a self-catering holiday home throughout the year. The cottages were built at the same time as the lighthouse, but were modernised in 2002 and offer a unique holiday experience. 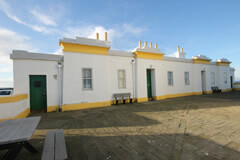 The lighthouse and cottages are now owned by the Covesea Lighthouse Community Company Limited who are delighted to be able to make them available to rent. This accommodation is ideal for families with small children and situated within the courtyard below the Lighthouse Tower with a superb sandy beach practically on the doorstep. The beach is accessible via a gate from the lighthouse courtyard. There is a fence surrounding the lighthouse which makes this area safe for young children. 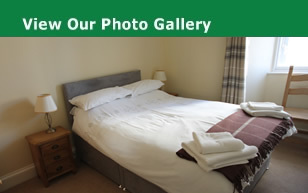 Covesea Cottage is a two bedroom cottage that sleeps 4. It has 1 twin and 1 double bedroom, an open-plan fully equipped kitchen/sitting room with breakfast bar, and a bathroom with bath and separate shower cubicle. Halliman Cottage is a three bedroom cottage that sleeps 6. It has two twin bedded rooms and the 3rd bedroom has adult sized bunk beds. Halliman has a separate sitting room and dining room with a fully equipped galley kitchen. It also has a bathroom with bath and separate shower cubicle. 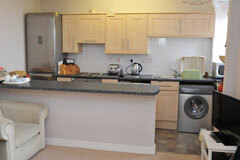 Both cottages are equipped with Flat Screen TV’s with freeview and DVD players. Parking is available beside the accommodation. The coastal town of Lossiemouth is just over a mile away and can be reached by walking along the lovely beach. It offers the visitor a range of facilities including sea angling, two 18-hole golf courses, stunning unspoilt beaches and wildlife, an excellent range of shopping and quality restaurants and cafes, all making the most of the plentiful supply of fresh seafood. The Aroma Cafe just five minutes' walk to the west of the Lighthouse serves wonderful breakfasts and the freshest of food for lunches and afternoon tea. The Silver Sands Holiday Park to the east of the Lighthouse also has a shop,cafe,bar and a play area for the children.